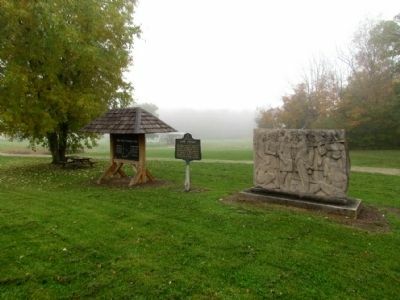 Northern boundary of the Indiana Territory established by the 1809 Treaty of Fort Wayne between Gov. W.H. Harrison and the Indian tribes, Miami Chief Little Turtle presiding. The line followed the shadow of an upright spear at 10:00 A.M. Historic Gosport is the only town directly on the line. 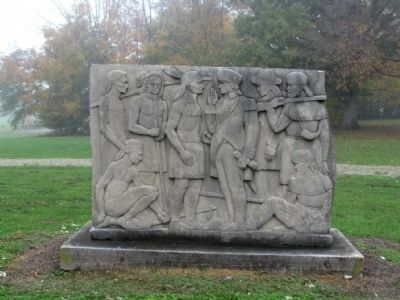 The monument was designed and sculptured by noted Owen County artist and sculptor F.L. Hollis, on land made available by the David Gray family, descendants of Ephraim Goss, first settler in Gosport (Goss's Port) in 1818. Erected by Gosport Lion's Club. Location. 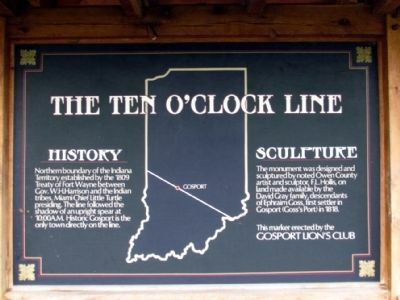 39° 21.29′ N, 86° 40.061′ W. Marker is in Gosport, Indiana, in Owen County. Marker is at the intersection of State Road 67 and N. 7th Street, on the right when traveling south on State Road 67. Touch for map. Marker is located at a roadside park. Marker is in this post office area: Gosport IN 47433, United States of America. Touch for directions. Other nearby markers. At least 8 other markers are within 8 miles of this marker, measured as the crow flies. Camp Hughes (here, next to this marker); Ferry Bridge (approx. 1.6 miles away); Stinesville Limestone Industry (approx. 4 miles away); Owen County (Indiana) War Memorial (approx. 7 miles away); Owen County War Memorial (approx. 7 miles away); Owen County Courthouse (approx. 7 miles away); American Revolution War Memorial (approx. 7.3 miles away); Civil War Cannons - Owen County Indiana (approx. 7.3 miles away). Touch for a list and map of all markers in Gosport. More. Search the internet for The Ten O'Clock Line. Credits. This page was last revised on June 16, 2016. This page originally submitted on November 5, 2013, by Duane Hall of Abilene, Texas. This page has been viewed 622 times since then and 22 times this year. Photos: 1, 2, 3. submitted on November 5, 2013, by Duane Hall of Abilene, Texas.